Stick with me here. The plot recap is gonna get a bit rocky. 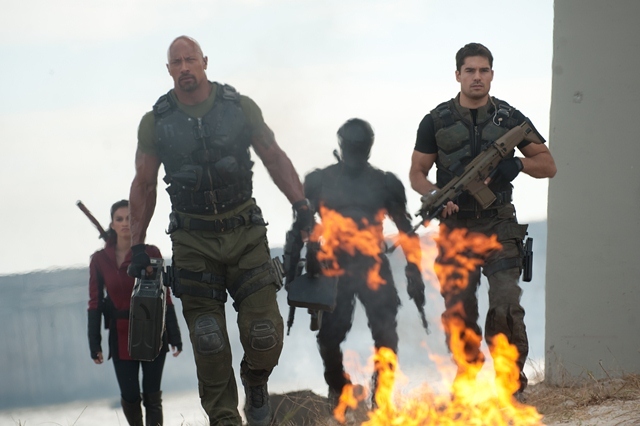 The Joes, led by Duke (Channing Tatum) and featuring Roadblock (Dwayne Johnson), Jaye (Adrianne Palicki), Mouse (Joseph Mazello), and Flint (D.J. Cotrona), are sent to Pakistan to retrieve some nuclear weapons by the President (Jonathan Pryce). Only it turns out that the President is really Zartan (Arnold Vosloo, although he has no lines) in disguise. President Zartan frames the Joes and has most of them killed in his plan to plunge the world into Cobra chaos. At the same time, he sends Firefly (Ray Stevenson) to break Storm Shadow (Byung-hun Lee) and Cobra Commander (Luke Bracey) out of a legendary underground prison. 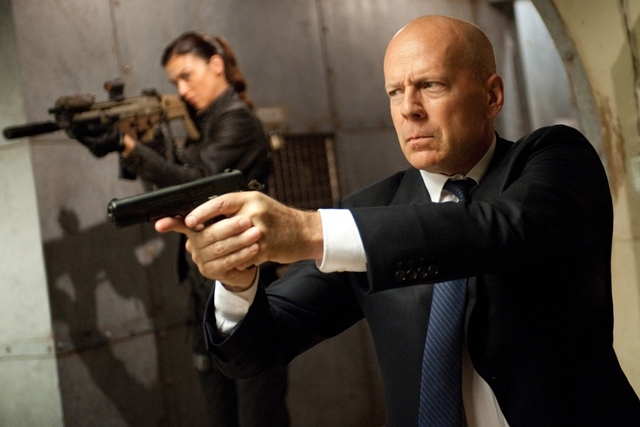 And I can’t even get started on figuring out exactly how RZA and Bruce Willis got into the plot. Oh, and Jinx (Elodie Yung) and Snake Eyes (Ray Park) get involved at some point. Don’t ask me how. Don’t ask the writers either. There are chunks of “G.I. Joe: Retaliation” that make absolutely no sense. And when the film doesn’t take itself seriously, this nonsensical, cartoonish plotting didn’t bother me. It is based on a toy line and cartoon series, friends. Let’s not expect “Inception.” And there are a few actors and set pieces in which this blockbuster aspect of “Retaliation” really works. For example, Jonathan Pryce is having an absolute blast as the kind of maniacal world leader who plays “Angry Birds” as World War III is starting. He’s great fun in both roles (the still-alive, “real” President and the Zartan-in-disguise one). It’s also worth noting that a few of the actors really get the charismatic action star thing, most notably Johnson, Lee, Stevenson, and Palicki. They’re more fun and well-cast than most blockbuster actors you’ll see this summer. So why not give “Retaliation” a pass? I’m tempted and I honestly might have if it weren’t for the stupid, boneheaded, nonsensical decision to convert it into 3D after the fact just to get a bit more of your cash. When the 3D isn’t completely useless – half of the film doesn’t seem to have any of it all – it’s annoying. The 3D post-filming conversion process makes a film with an action aesthetic like this (choppy) almost impossible to watch. You can barely tell what the hell is going on in 2D and the third dimension makes that worse. If you have the choice, avoid the 3D version. “G.I. Joe: Retaliation” should have been better. Tighten up the plotting. Kill half of the “we’re doing it for our dead brothers” dialogue (not that there’s anything wrong with that, it’s just overdone). A little more Palicki & Johnson, a lot less RZA, maybe no Willis. As is, it’s a near-miss, a movie that I’ll probably end up watching on cable if it pops on but will have forgotten in two months when the real blockbusters like “Star Trek Into Darkness” and “Fast & the Furious 6” truly deliver the dumb fun. Hey, maybe some of it will even be kinda smart. “G.I. Joe: Retaliation” stars Dwayne Johnson, Adrianne Palicki, Jonathan Pryce, Byung-hun Lee, Elodie Yung, Ray Stevenson, D.J. Cotrona, Ray Park, Bruce Willis, and Channing Tatum. It was written by Rhett Reese & Paul Wernick and directed by Jon M. Chu. It opens on March 28, 2013.